While Russia may not be a world leader in the manufacture of cars, there is no doubting its expertise in the making of trucks. If you thought trucks were boring, you’ve never seen a rally of trucks. What surprises does the new KAMAZ truck hold as it undergoes its first test at the Silk Road rally? The sixth Silk Road rally, a prestigious international race, set off from Moscow’s Red Square on July 8. The world’s leading rally drivers are taking part in the rally. Among the headliners of the Moscow to Beijing rally are Russian trucks from the KAMAZ-Master team, which has for many years vowed audiences with their skill at the Dakar rally. 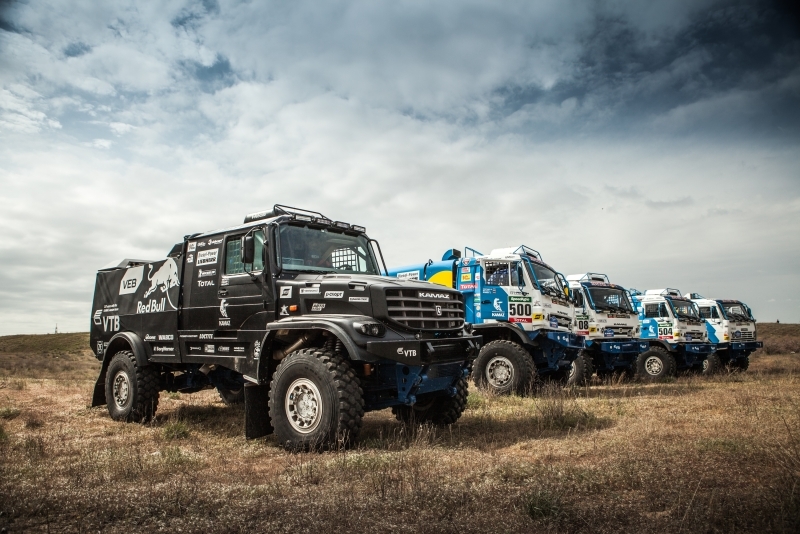 The team presented its new hooded truck (earlier KAMAZ trucks were not hooded – RIR), just before the Silk Road rally. The new truck, according to KAMAZ engineers, holds the key to future rallying success for Russia. Engineers are planning to give the new KAMAZ the team’s traditional colours by the time of the Dakar rally in January, once tests have been successfully completed. The new black truck will have its first test run in the Silk Road rally, with Eduard Nikolayev, the Dakar-2013 champion, as the man at the helm of the KAMAZ Masters. Although comfort (in the traditional meaning of the word) at a rally is a relative concept, all teams are trying to make their vehicles as comfortable for the crews as possible. Exhausted drivers cannot be expected to set new world records. The new KAMAZ truck is expected to be truly revolutionary as far as comfort is concerned. In the normal KAMAZ, the seats of the driver and the navigator are situated directly above the wheels. This raises the risk of spinal injuries because the impact of every small bump and pothole in the road gets magnified. In the new hooded version, the cabin has been moved to the middle of the wheel base, considerably easing vertical loads and blows. Nikolayev still maintains that he will make the truck perform at the maximum of its capabilities: “We shall be driving as fast as necessary to experience the usual pressures,” he told RIR before setting off. An interesting feature of the new truck is the symmetrical distribution of weight, or equal load distribution between the front and back axles. For a truck this is a huge advantage because the vehicle can make a smooth landing after a jump from a springboard and have better manoeuverability in the sand. By the time of the Dakar rally, in January however, KAMAZ engineers will have to give up this new feature. New rules were announced for the Dakar rally by the time the new model was ready, banning symmetrical weight distribution. So the engineers will have to make many changes and ease the load on the rear axle at the expense of the front one, Vladimir Guba, the team’s technical director told RIR. The first tests have shown that the hooded configuration makes it possible to better control the vehicle’s behaviour in featureless terrain. The new truck has shown spectacular results off-road, on road-test stretches of the route, where spatial orientation becomes particularly important. However, the hooded version of the truck does not ensure good vision in dunes. Team manager Sergei Savostin told RIR that no vehicle in the world can provide good visibility in a desert. When a truck climbs a dune, all that the driver can see – irrespective of whether it is a hooded truck or not – is the sky.